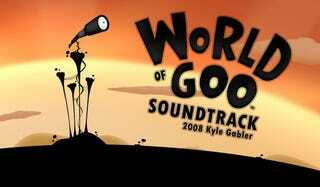 Kyle Gabler, likely riding high on all of the gamer and developer kudos that have been rolling in for World of Goo, is giving away the soundtrack to his game. The game's 27 tracks add up to an 85MB zip file. The mirrors are crashing fast, so if you're interested in getting the music, I'd hop over there pronto. This is the main theme of World of Goo, and the first chunk of music I wrote for the game, specifically for our first trailer. I wanted the theme of the game to somehow reflect the song Libertango by Astor Piazzolla, which was the track I used in the original Tower of Goo prototype back in school. Listen for a similar chord progression once the melody kicks in. A livelier version of Ode to the Bridge Builder. From a soundtrack I wrote for a friend's short film about going on a date with the devil. From one of my small games, Blow. From a soundtrack I wrote for a short kid's movie. Writing kid's music was difficult. Music I wrote for a virtual reality world. You are in a subway. And you are a giant banana. Almost didn't include this one in the game, but a friend convinced me a few days before we finished. I'm glad he did! Theme I wrote for a friend's drama/mystery series. I recorded two friends singing single notes, and then I was able to play them back with my keyboard to get a "choir". This became the theme for "progress" in the game. A variation is used for MOM's theme. Recorded some great singers from Carnegie Mellon. This is the first time the "what's up there anyway" theme can be heard. You can hear the same theme in the tracks Years of Work and The Last of the Goo Balls. I wrote this one back in high school, which makes me feel old. You can hear a nod to phantom of the opera in a section of the organ part. I had forgotten this song existed, and was glad to find it burned onto an old rotting cd-rom. I think this was the first time I ever recorded someone singing. Only the second half of this clip is used in the game. Originally written for a friend's NES game Dikki Painguin. This was the second track I wrote for the game. The goal was to make a variation on Amazing Grace, in the style of those old western soundtracks by Ennio Morricone. This has become the unofficial second theme to World of Goo, after we used it in our second trailer. I originally wrote this for an animated short film I made with some friends. I recorded a bunch of performers all huddled around a single microphone in my bedroom to get the layers used in this track. Drums were made by banging on chairs and cardboard boxes. I wrote this in 2001 as a joke for a music class in undergrad. Only the beginning of this song is used in the game, and for only one level, but it has become one of the most requested pieces of music. So, here's the "full song", but it comes with a warning - this song is designed to sound like every cheap 90's dance song ever made. The singer is great though, an astrophysicist named Jessica. I gave a her a chainsaw for her wedding and we never spoke again. The end. Main theme to World of Goo, and used in our third and final trailer.